Day 19 was a travel day for the Ramblin” Rose. 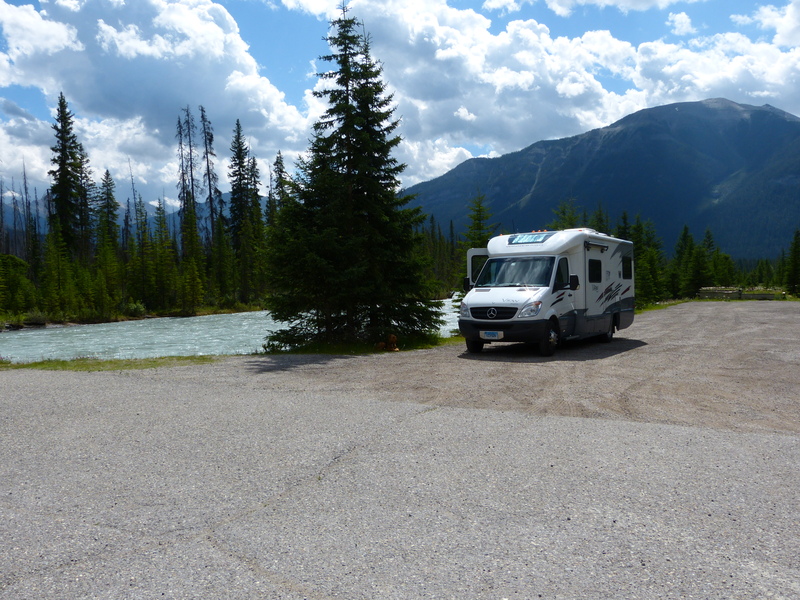 We left the Lake Louise Campground and headed for Red Streak Campground in Kootenay National Park. 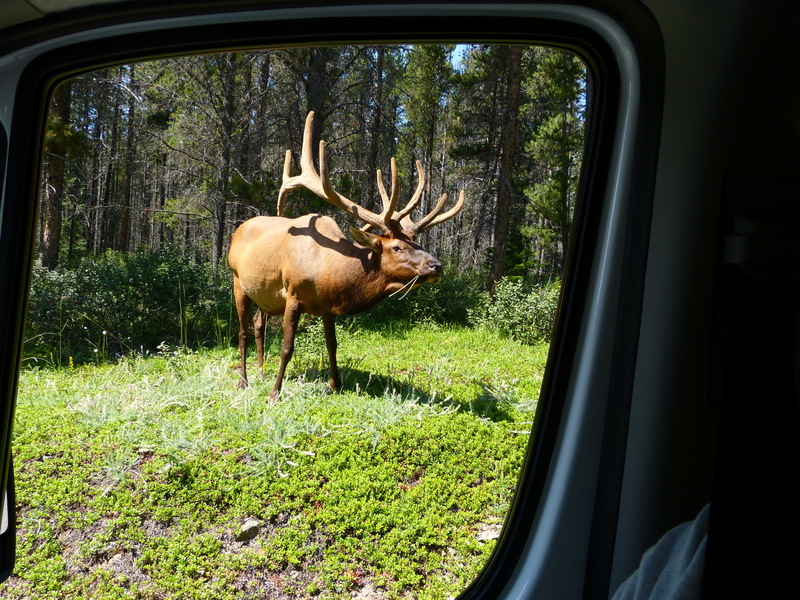 Another Elk from the View’s window as we leave Banff. The drive from Banff to Lake Louise was delightful! Steep cliffs on the side of the road, steep grades, and amazing views followed us much of the way to Radium Springs. We had a sunny, clear day and the road was so steep that I found it scary! Charlie and WB would never admit to such a thing, and thought it was just fine. We stopped for lunch by a roaring glacial river, a very pretty spot where Woolly Bear could stretch his legs and play a bit. After lunch and a short walk, we continued through Kootenay NP toward our destination, the Red Streak Campground just out side of the town of Radium Springs. 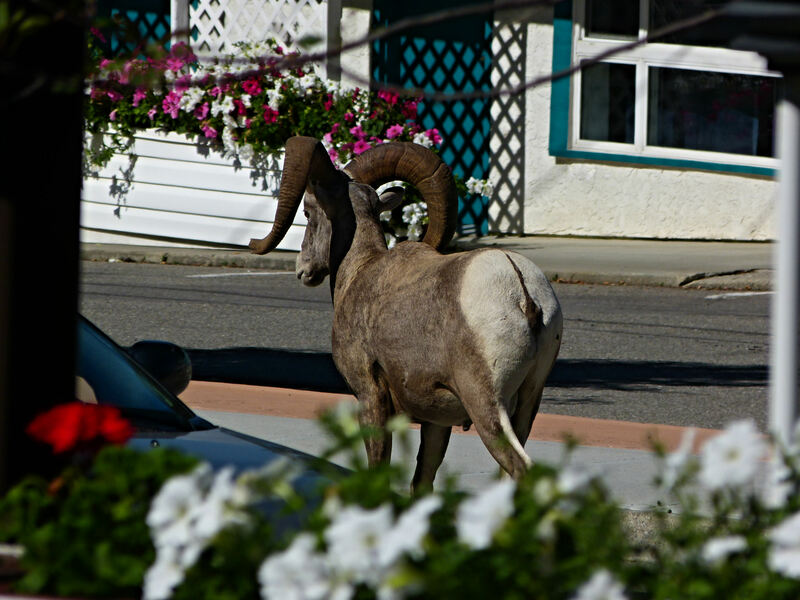 We had to drive through the town to get to our campsite, and were amazed at all the Big Horn Sheep strolling the center of town! No one else seemed to notice them, so they must be frequent visitors. 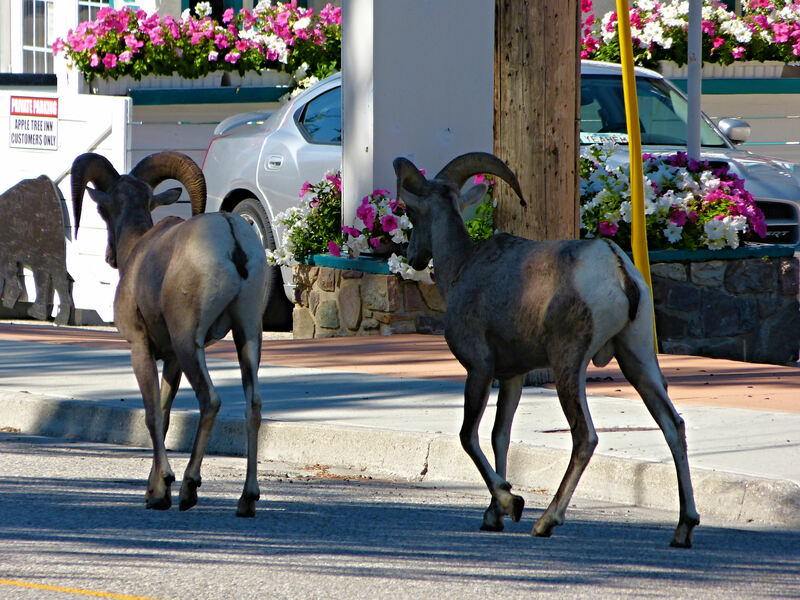 But, Charlie and I have spent days and many hikes looking for good photo opts of Big Horn Sheep, and we were not going to miss this opportunity, even though they were pretty close to tame! Not quite the same as finding the elusive Big Horn Sheep at Yellowstone. 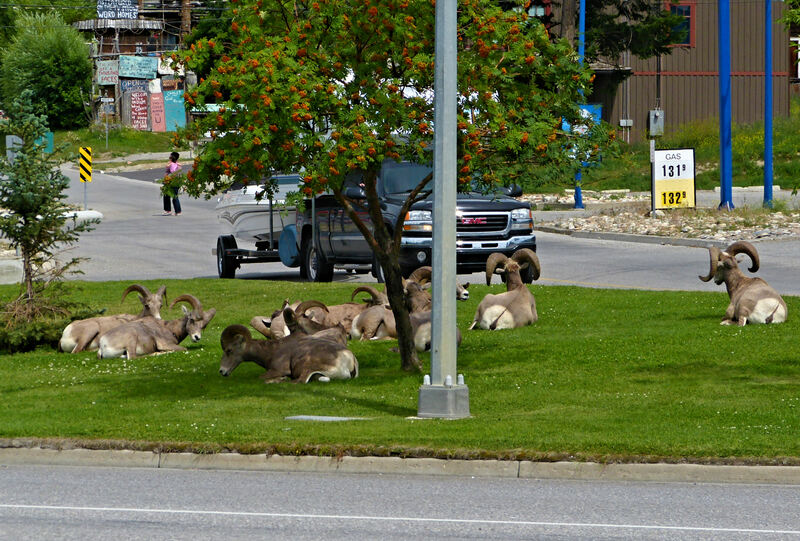 After enjoying the sheep in downtown Radium Springs, we bought some ice and restocked the pantry, then made our way to our campground. 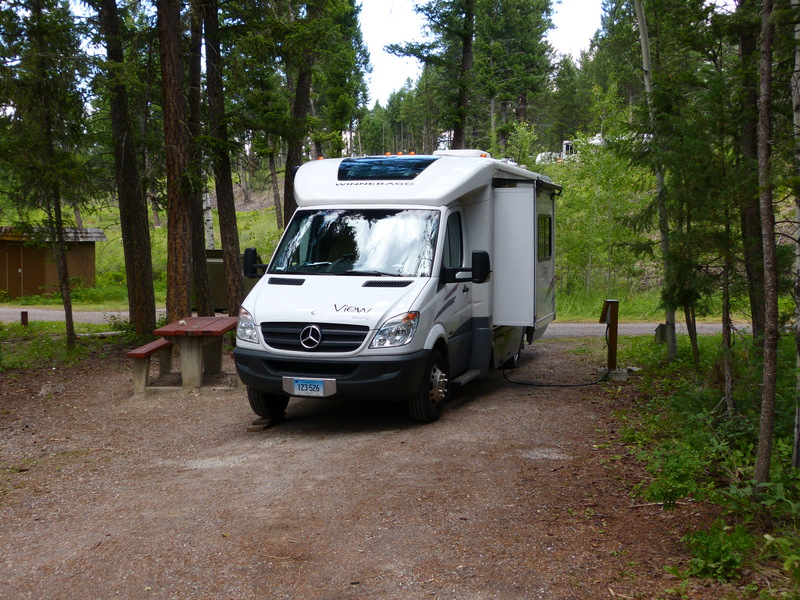 Campsite at Red Streak Campground, Kootenay NP near Radium Springs. This entry was posted in Uncategorized on July 16, 2013 by Ramblin' Rose. Wow!! 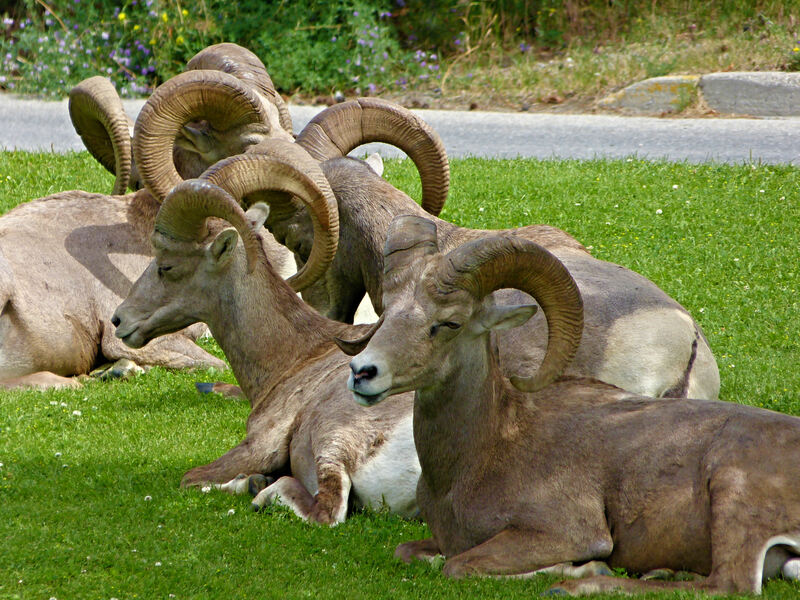 These Big Horn Sheep are absolutely majestic ! Well…the Ramblin’ Rose adventure team is about to launch very very soon…as we all wait with excited anticipation to follow your every adventure! Charlie’s photographs are amazing! He captures the mood and exhilarating feeling in each one! Thanks, Liz. I’ll tell Charlie you like his pictures!